put in the Krypteia – a secret squad that would sneak up on unsuspecting slaves and brutally murder them at will. Of course, there was a dark side to this ruthless pursuit of military might. For example, the Spartan slaves known as helots endured unimaginable suffering while living alongside a society of trained killers. The helots were brutalized, humiliated, and – via a brutal rite of passage that the Spartans called the Krypteia – hunted down and killed. 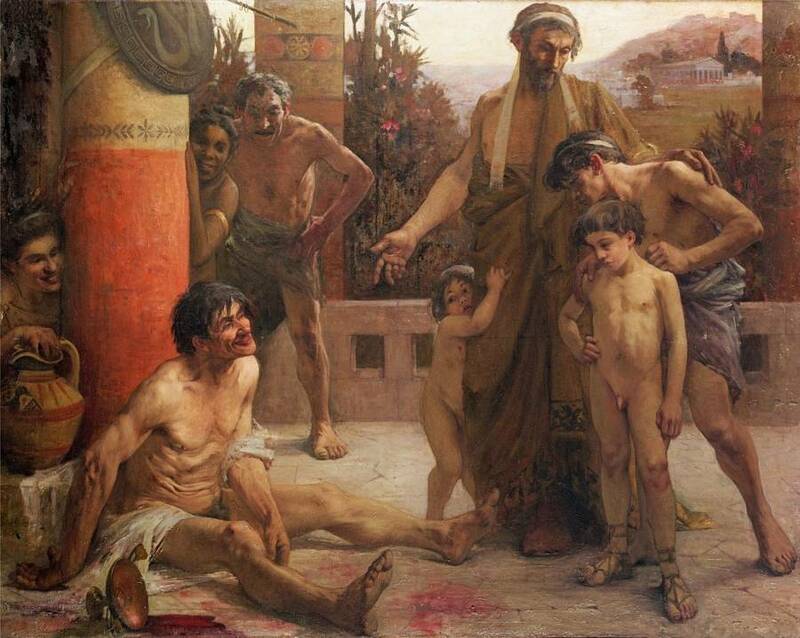 A helot slave is forced to get drunk and humiliate himself to teach a young Spartan boy about the dangers of alcohol. Slavery was a major part of ancient Spartan society. When we think about Sparta, we tend to think about the warriors that led their city, but they were only a small part of the population. Those Spartan warriors were nothing more than a small, elite class, ruling over a much larger society. In fact, slaves outnumbered citizens seven to one in Sparta. Despite their numbers, though, slaves were treated in unimaginably horrible ways — even by the standards of slavery. Their lives were full of humiliation. They would be beaten if they tried to sing Spartan songs because it suggested that they viewed themselves as equals. And to teach boys and young men about the dangers of drunkenness, adult Spartan males would get their slaves drunk and force them to embarrass themselves. The worst torture that Spartan slaves endured, however, was undoubtedly the Krypteia. The Krypteia (which can refer both to the group in question and the acts that they carried out) was a state program that, at any moment and without the slightest warning, could have a helot slave jumped by a group of young Spartan men and stabbed to death. The best and brightest Spartan boys would become part of the Krypteia as they were on the verge of becoming men. To train them for warfare, they would be given daggers and a few essential supplies, then ordered to murder helots at will. They would sneak along roads and into fields, often in the countryside and often at night, and pounce on unsuspecting helots. Whenever they could, they would target the biggest and the strongest among them. It didn’t matter if they’d been loyal or if they’d done anything wrong – whoever they were, they would be hunted down, cut to shreds, and brutally killed. According to Plutarch, Spartan elders would check each newborn baby to see if it is worthy of life or if should be abandoned to die of exposure. 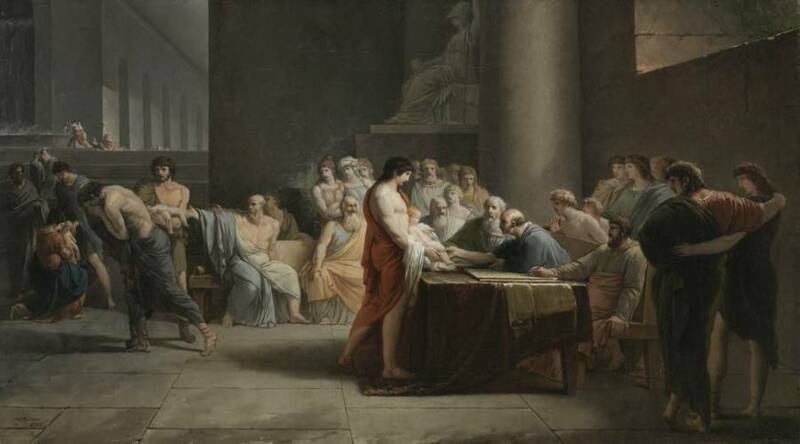 The famous Athenian writer Plutarch called the Krypteia an “injustice” and struggled with the reality that Lycurgus, a Spartan leader that he respected, had spearheaded such a barbaric ritual. For people like Megillus, massacring slaves was just another great way to make Spartans tough – right up there with proud Spartan traditions like forcing young boys to steal food to eat and throwing weak babies into the wild to die. 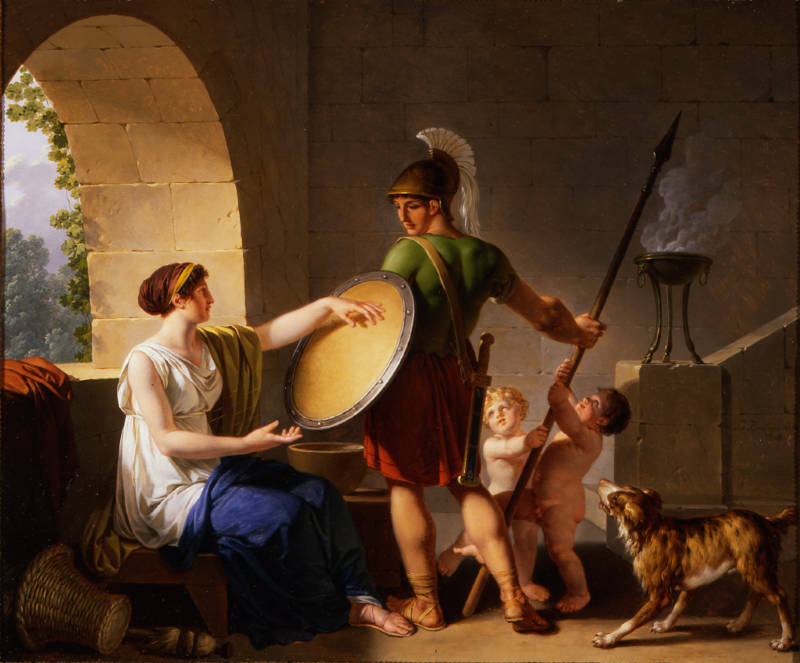 A Spartan mother gives her son his first shield. One would think that a program as brutal as the Krypteia would have a definitive reason for being, but accounts actually vary as to why it existed. Several contemporaneous Athenian writers described the Krypteia, but even they seemed to struggle to understand how the Spartans justified massacring innocent people. However, we do know that it was at least partly a way to make boys tough, as Megillus’ words make clear. This was more than just practice playing at war – the boys in the Krypteia had to actually take lives. They had to prove that, when they were facing down a real enemy, they wouldn’t hesitate to kill. But the Krypteia was also about instilling fear into the helots. After all, Sparta was the place where, in 491 B.C., they reportedly put wreaths on the heads of their 2,000 strongest slaves and promised them their freedom – then lured out to a temple and killed them all. The Krypteia itself started, by some accounts, after a slave revolt around this same time nearly toppled the Spartan government and won the helots their freedom. The Spartans managed to stop it – but they learned to fear the slaves that outnumbered them. Every year afterward, the Spartans declared war against their own slaves. Killing a slave, from then on, wasn’t an act of murder or cruelty, it was an act of war. Their slaves weren’t fighting against them now – but the Spartans wanted to make it perfectly clear just what would happen if they ever tried to fight for their freedom again. Thus the brutal program of Krypteia was born.